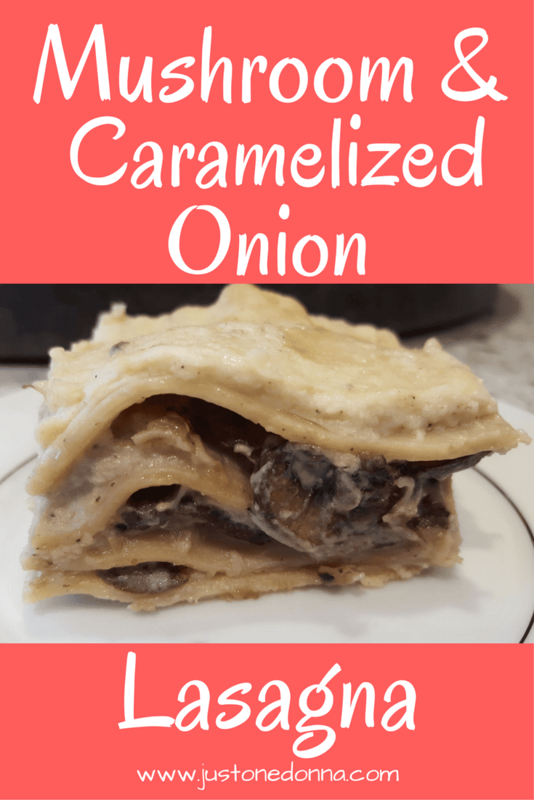 This Mushroom and Caramelized Onion Lasagna is a family favorite. I make it once a year for our Christmas dinner because it is just that special. Family members actually ask specifically about whether this lasagna will be on the holiday dinner menu. They would be very disappointed to hear it is not. That's why I'm surprised I haven't shared it with you before now. Add this mushroom lasagna to your repertoire and standby for the raves. You will be a lasagna hero. 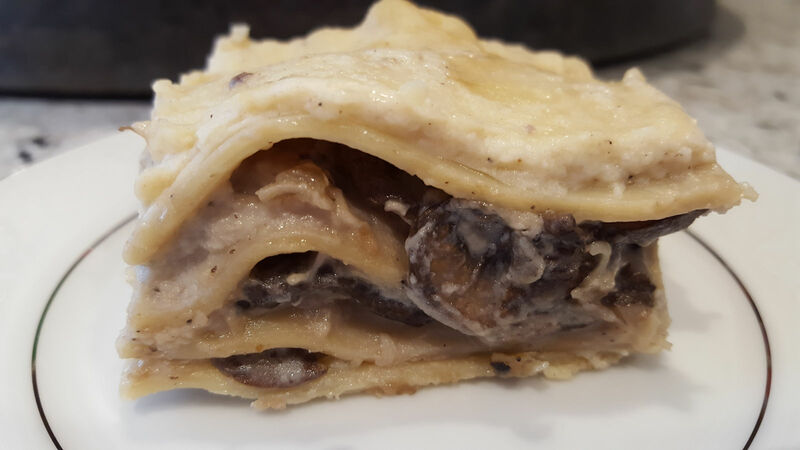 It freezes well, so you can make the mushroom lasagna ahead of time to dazzle your family and friends with mushroom yumminess. This yummy lasagna was introduced to me about fifteen years ago by a caterer. I hosted a holiday party for work colleagues and asked my caterer for a menu that would be perfect for a buffet. She suggested mushroom lasagna for one of the dishes. Well, it was a huge hit. Everyone at the party raved about the food and especially the mushroom lasagna. Of course, I asked the caterer for the recipe. Not surprisingly, it was a Barefoot Contessa recipe. 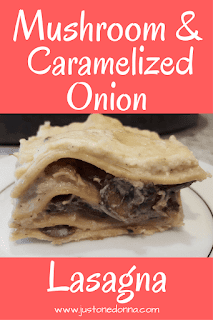 That recipe is the inspiration for my Mushroom and Caramelized Onion Lasagna. I love that the recipe is fairly simple in that the main focus is mushrooms. A simple white sauce binds the dish together. I've made a few changes to the original Barefoot Contessa recipe over the years. First, I always use Crimini mushrooms because they are easier to find at my local stores than the larger Portobello mushrooms. Secondly, I always use two and a half pounds of mushrooms per lasagna. More mushrooms make this a more substantial lasagna. Lastly, I add caramelized onions for a little extra flavor. I purchase whole mushrooms for this dish but you can use pre-sliced mushrooms. I like to control the preparation of the mushrooms. You can buy pre-sliced mushrooms, if you prefer, to speed the process. 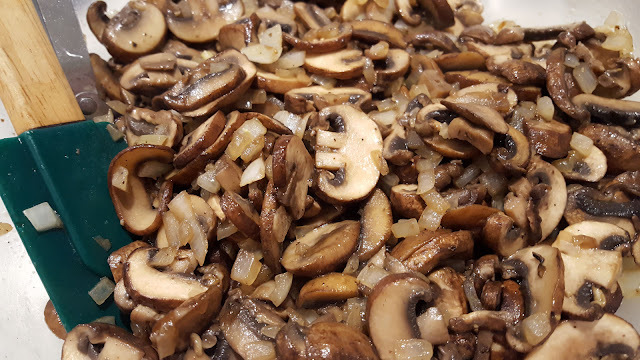 Cleaning and slicing two and a half pound of mushrooms can be a tedious and time-consuming process so purchasing already sliced mushrooms will dramatically shorten your prep time. Two and a half pounds of sliced mushrooms is a lot of mushrooms. You'll need a large frying pan to be sure there is enough space for the mushrooms to get a little brown on them. I use my large rectangular electric frying pan that gets the job done for me. If you have a smaller frying pan, split the amount of mushrooms in half when cooking them. You should plan to grate fresh nutmeg for this lasagna. There aren't many ingredients in this dish so you'll want the nutmeg flavor to shine through. I have this nutmeg grater that does the job for me. Even though there are just a few ingredients in this lasagna, the process is time-consuming. I average about an hour and a half of preparation time when making this dish. You'll need to clean and slice the mushrooms, chop the onions, cook the onions and mushrooms, prepare the white sauce, and assemble the lasagna. This deliciousness takes time and is very much worth your effort. You can make this lasagna ahead of time and freeze prior to baking. Just be sure to thaw the lasagna completely before cooking for best results. Thawing the lasagna overnight in your refrigerator works well. 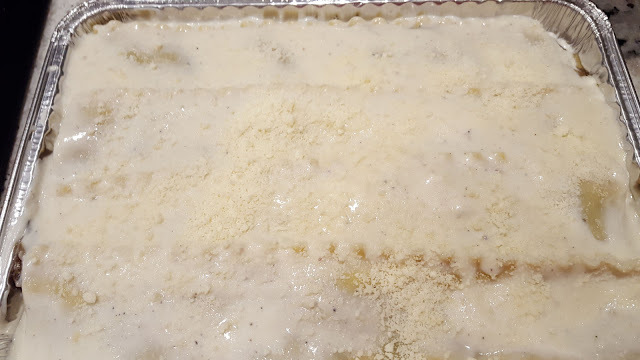 I like to use disposable aluminum baking dishes when making multiples of this lasagna for my freezer. 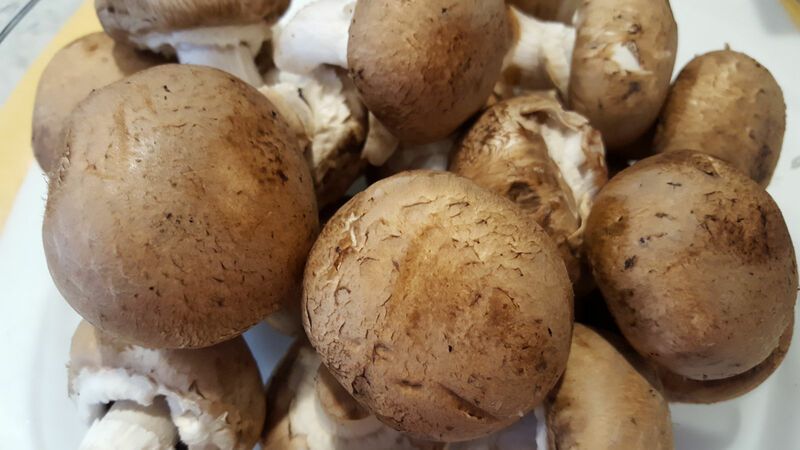 Clean your mushrooms by brushing them gently with a towel or a pastry brush. Trim the stems and slice the mushrooms. Heat two tablespoons of butter with the olive oil in a large skillet. Add the mushrooms to the pan. Leave them without turning until they are lightly browned on one side. Season with a little salt and pepper. Stir and continue cooking until soft. Remove to a bowl. Add the onion to the pan. Season the onion with a little salt and pepper. Cook the onion until lightly browned and caramelized. Remove to the bowl with the mushrooms. Heat the milk in a heat-safe, four-cup measuring cup in your microwave or in a pot on your stove. Melt eight tablespoons of butter in a saucepan over medium heat. Add the flour to the melted butter and cook for about a minute. Add the hot milk to the butter mixture, stirring to combine. Season with two teaspoons of salt, one teaspoon of pepper, and the nutmeg. Stir and keep cooking until the sauce thickens. You'll be able to draw a line through the sauce on the back of your spoon when it is ready. Remove the sauce from the heat. Cook sixteen lasagna noodles according to the package directions. Spread a few spoonfuls of sauce in the bottom of your lasagna pan . Spread four lasagna noodles over the sauce. Add a layer of sauce to the noodles. Spread one-third of the mushroom and onion mixture over the sauce. Sprinkle with 1/4 cup of Parmesan cheese. Complete two more layers of noodles, sauce, mushroom mixture, and Parmesan cheese. Top with a final layer of noodles, sauce and Parmesan cheese. Bake the lasagna in a preheated 350 degrees F oven for approximately 45 minutes or until browned on top and bubbly. Let sit for twenty to thirty minutes before serving. You absolutely want to let the layers set before cutting the lasagna. 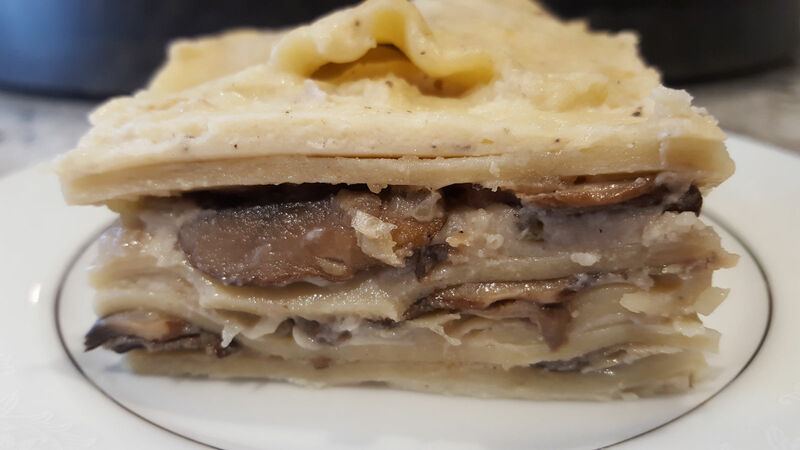 This mushroom lasagna also tastes great at room temperature. Thanks for sharing this post with your friends, Facebook, Pinterest, and Twitter shares are appreciated. Looks yummy! I just printed a copy of the recipe! It may be my New Year's Day dinner!! Thanks! MMMmmm, Rosie. That will be a tasty New Year's Day dinner. I hope you enjoy it as much as we do!